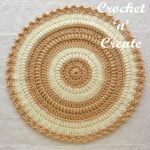 Crochet Placemat-Coaster Set – This free and beautiful crochet pattern will decorate your dining table, make in colors to match your decor, the design will suit beginners and experts alike. It is written in USA and UK formats, just scroll down the page to get the one you prefer. 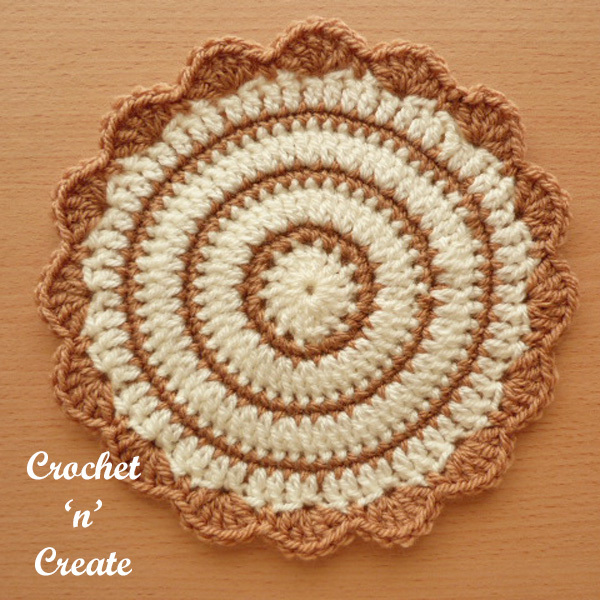 This entry was posted in crochet coasters, crochet for the kitchen, crochet table mat, Table Mats and tagged crochet, crochet coaster, crochet for Kitchen, crochet placemat on 20th March 2019 by crochetncreate. 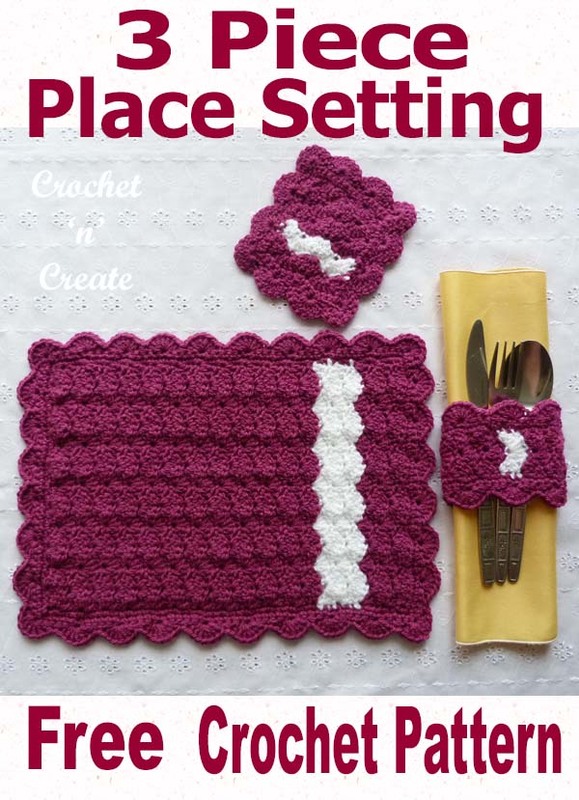 Place Setting Free Crochet Pattern – You can make this three piece set for gifts or decorate your own table with it, it is suitable for the family or when you have guests around the table. 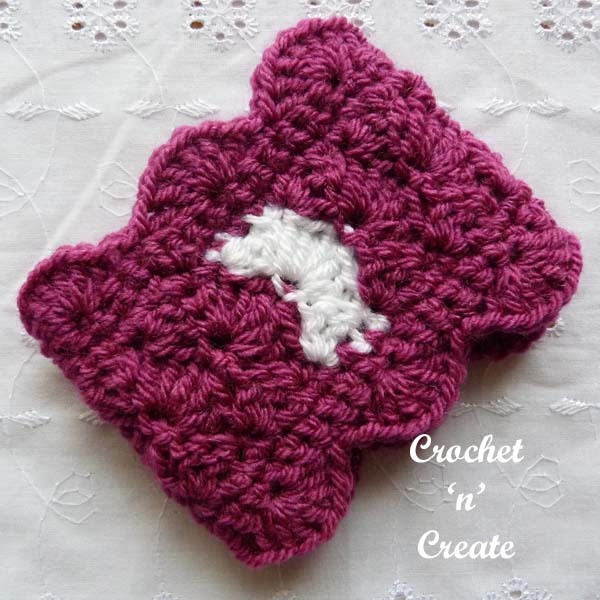 The place setting includes a place mat, coaster and napkin ring, the design is made in a close textured stitch. 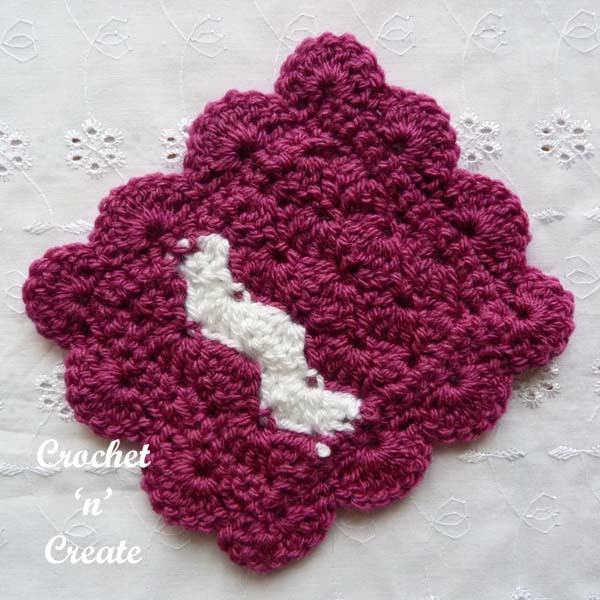 This entry was posted in crochet coasters, crochet for the kitchen, crochet table mat, Table Mats and tagged crochet, crochet coaster, crochet for home, crochet for Kitchen, crochet placemat on 23rd January 2019 by crochetncreate. 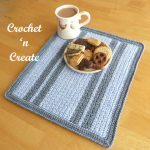 This pretty place setting includes a place mat, coaster and napkin ring, I have crocheted the design in a close textured stitch. Make this three piece set to decorate your own table or for gifts, it is suitable for the family or when you have guests coming around. 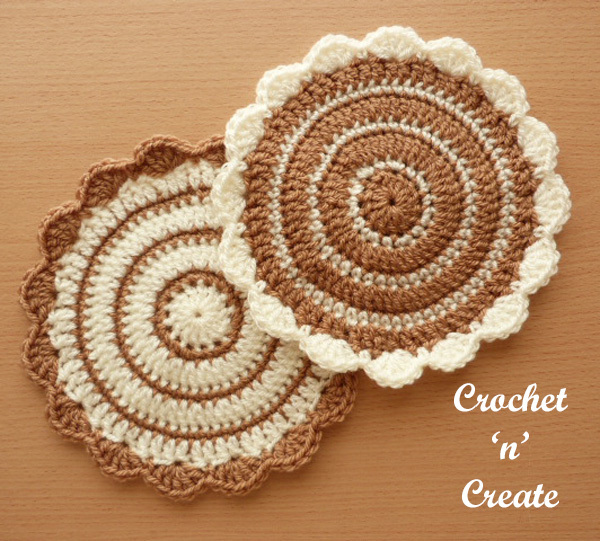 See more of my free crochet patterns for place mats and coasters. Pattern Row 1 – 3ch, 2tr into base of 3ch, * miss 2tr, 1dc into the centre tr of 5tr group, miss 2tr, 5tr group into next dc, * rpt from * to * to last dc, 3tr into last dc. Turn. Pattern Row 2 – 1ch, 1dc into base of 1ch, * miss 2tr, 5tr group into next dc, miss 2tr, 1dc into centre tr of 5tr group, * rpt from * to * to last dc, 2tr and 3ch, work 5tr into next dc, miss 2tr, 1dc into top of 3ch. Turn. 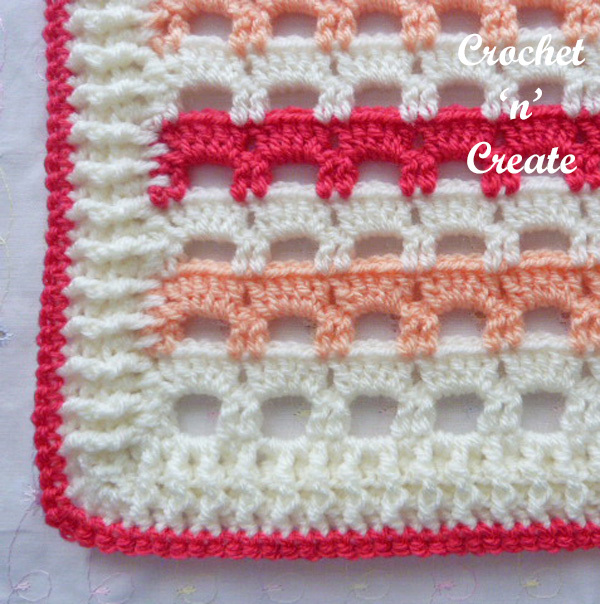 Rpt Pattern Rows 1 & 2 until 23 rows have been worked in all. Turn. Fasten off. Join in colour 2. Work Pattern Rows 1 & 2 twice. Turn. Fasten off. Join in colour 1. Decorative Edge – 1ch, 1dc into base of 1ch, * 1dc into each of next 5tr, 1htr into dc, * rpt from * to * to last dc, 3dc into dc, work 45dc evenly into row ends down first side of placemat, 3dc into the corner, work 1dc into each ch along starting ch edge, 3dc into the corner, work 45dc evenly into row ends up second side of placemat, 1dc into corner, ss to first dc on beginning of row. Turn. Next Row – 1ch, 1dc into base of 1ch, 1dc into each st all around 4 sides of placemat to end, working 3dc into corners, ss to first dc on beginning of row. Turn. Shell Edge Row – 3ch, 3tr into base of 3ch, * miss 2dc, 1dc into next dc, miss 2dc, 7tr into next dc, * rpt from * to * around all sides to end, work 3tr into base of 3ch on beginning of row, ss to top of 3ch. Finishing – Weave in and trim off all loose ends. Rpt Pattern Rows 1 & 2 from placemat twice until 5 rows have been worked in all. Work Pattern Rows 1 & 2 once. Work Pattern Rows 1 & 2 once. Turn. 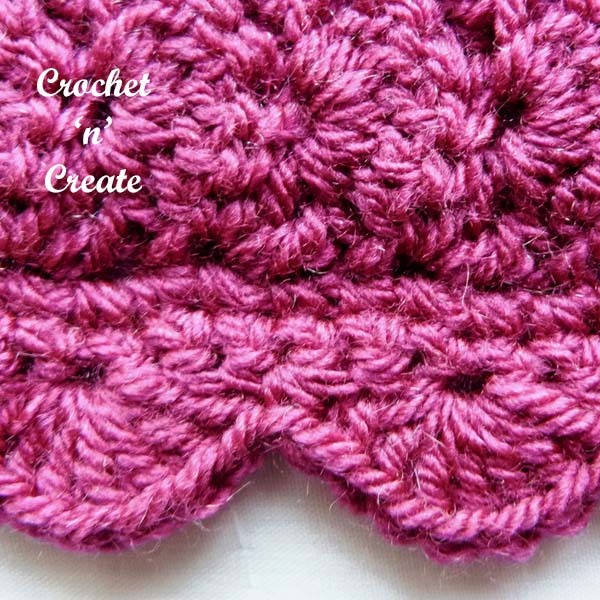 Decorative Edge – 1ch, 1dc into base of 1ch, * 1dc into each of next 5tr, 1htr into dc, * rpt from * to * to last 3tch, 3dc into top of 3ch, work 12dc evenly into row ends down first side of coaster, 3dc into corner, work 1dc into each ch along starting ch edge, 3dc into corner, work 12dc evenly into row ends up second side of coaster, 1dc into corner, ss to first dc. Turn. Next Row – 1ch, 1dc into base of 1ch, 1dc into each st all around 4 sides of coaster to end, working 3dc into corners, ss to first dc. Turn. 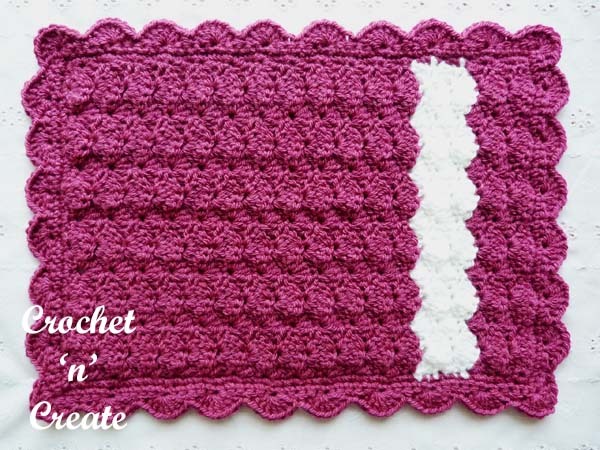 Rpt Pattern Rows 1 & 2 same as for placemat three times until 7 rows have been worked in all. Turn. 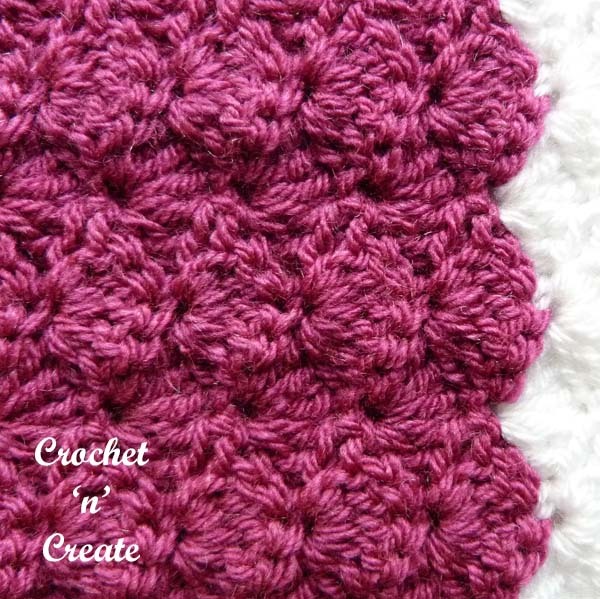 Rpt Pattern Rows 1 & 2 six times until 21 rows have been worked in all from beginning. Fold napkin ring from bottom to top, ss last row worked and starting ch edge together to make a round. Turn work through so ss seam is on the inside. Next Row – 1ch, 1dc into base of 1ch, 1dc into each dc to end, ss to first dc. Turn. 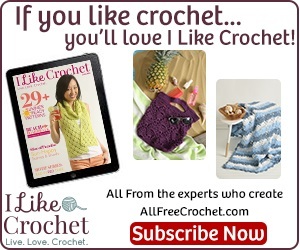 All pattern sizing, yarn weights, gauges etc on this website are approx as everybody crochets differently. 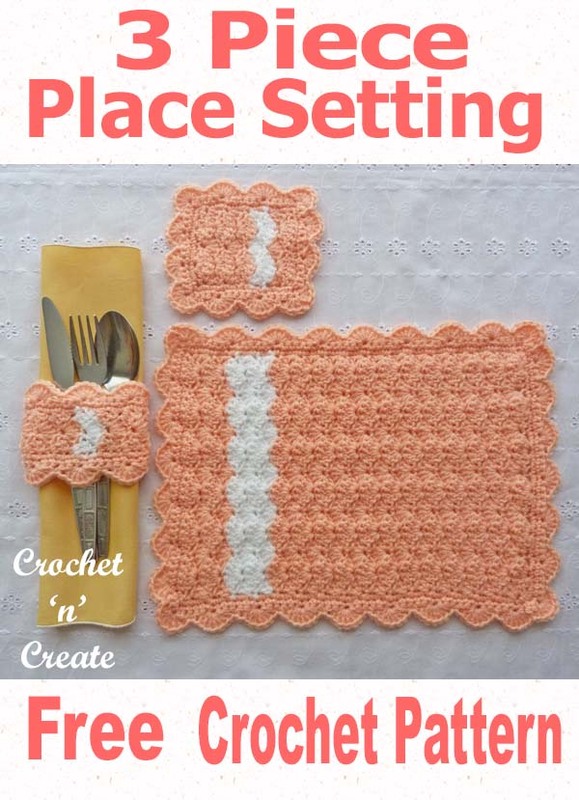 The written instructions and pictures for this three piece place setting uk free crochet pattern are copyrighted to crochet ‘n’ create © 2019. 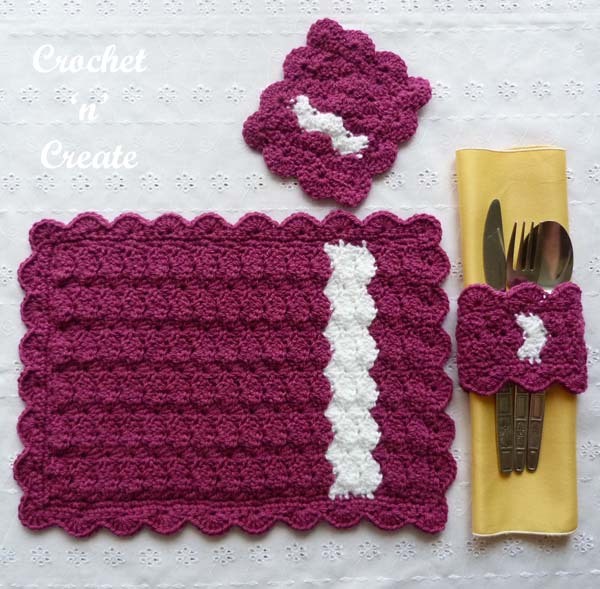 You are welcome to sell the finished products made from the three piece place setting uk free crochet pattern, I just ask that you please use your own pictures and put a link back to crochet ‘n’ create. 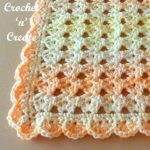 DO NOT share the written instructions for this pretty three piece place setting uk free crochet pattern. 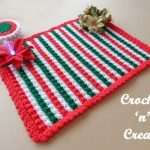 This entry was posted in crochet coasters, crochet for the kitchen, crochet table mat, Table Mats and tagged crochet, crochet coaster, crochet for Kitchen, crochet placemat on 23rd January 2019 by crochetncreate. 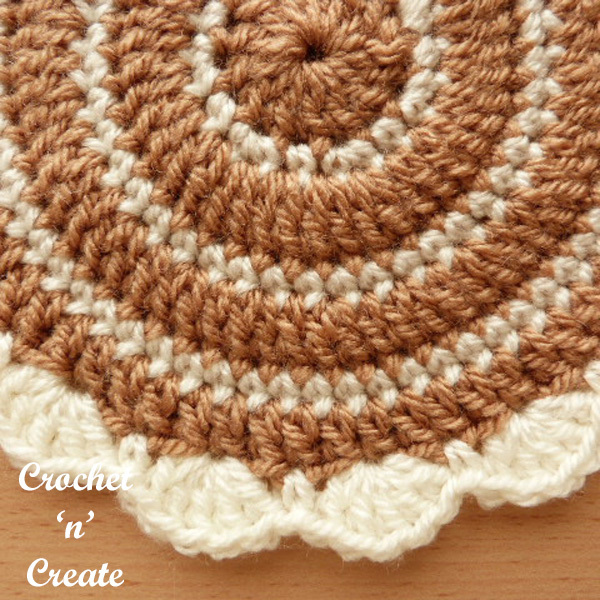 Flowerpot Mat UK Free Crochet Pattern – With easy simple stitches and finished with a shell edge. 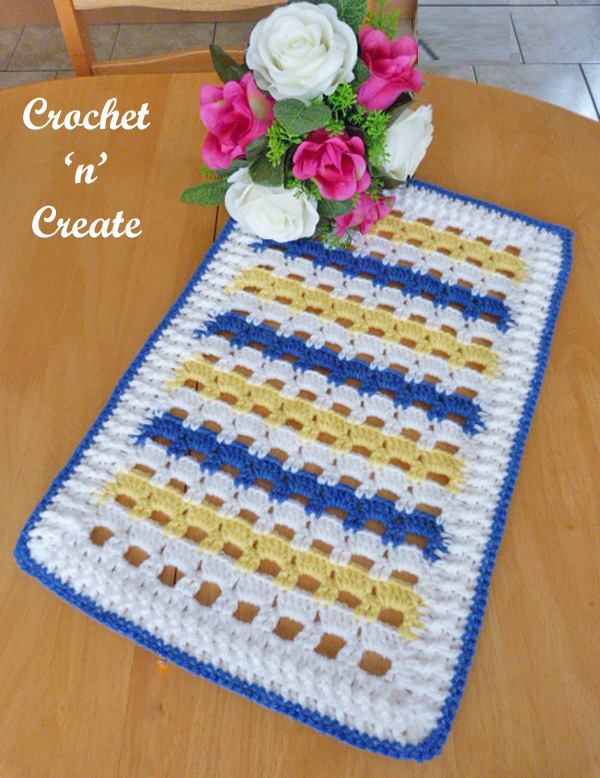 A pretty mat you can make for use around your own home or crochet for house warming gifts, make in colours to match your decor. 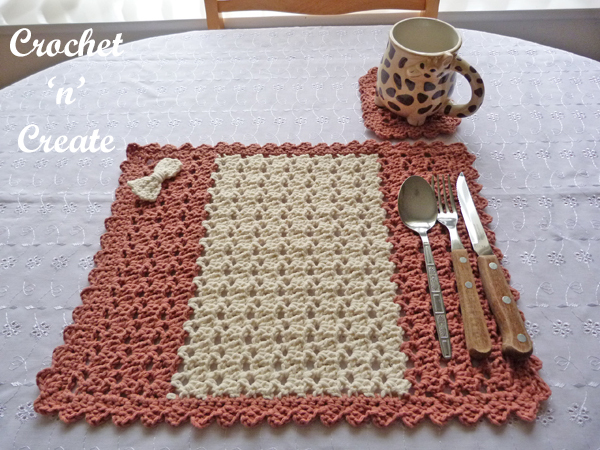 See more of my free crochet patterns for table mats. Worked in rounds without turning throughout. Using colour 1 make a magic circle, (RS) 3ch work 13tr into ring, pull loose thread to close ring, ss to top of 3tch on beginning of row. Finishing – Weave in and trim off loose ends of yarn. 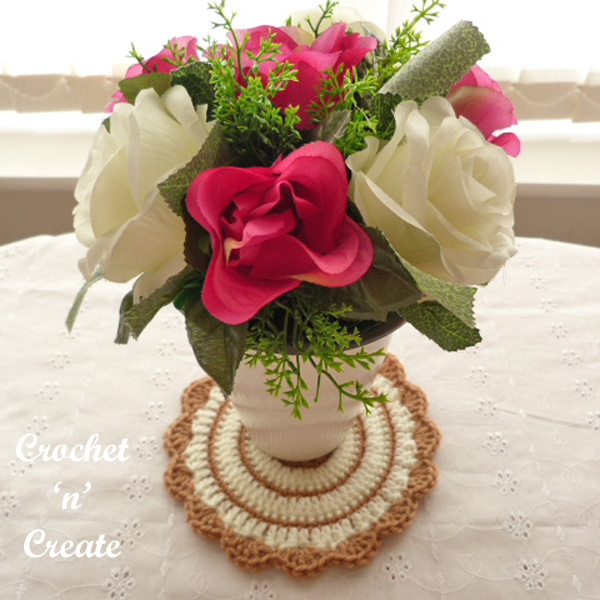 The written instructions and pictures for this flower potmat uk free crochet pattern are copyrighted to crochet ‘n’ create © 2018.
flowerpot mat uk free crochet pattern, I just ask that you please use your own pictures and put a link back to crochet ‘n’ create. 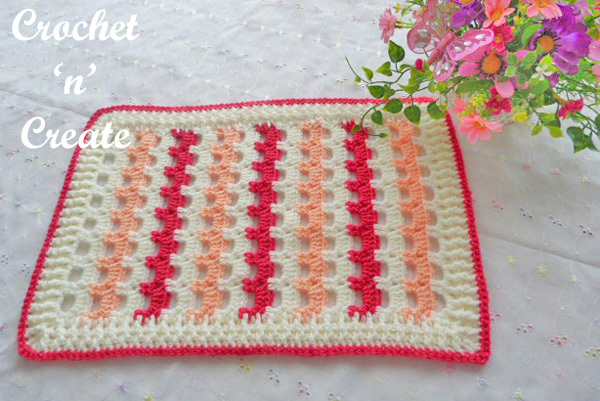 DO NOT share the written instructions for this flowerpot mat uk free crochet pattern. 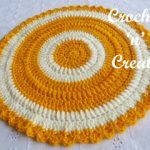 This entry was posted in crochet for the home, crochet table mat, Table Mats and tagged crochet, crochet doily, crochet flowerpot mat, crochet mat, crochet plantpot mat on 19th December 2018 by crochetncreate. 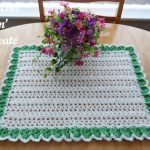 Free Crochet Pattern-Table Mat – Make this table mat to brighten up your dining table, it will also increase your crochet skills, made up of mostly dc stitch with sc edge, you will love the final look to it. 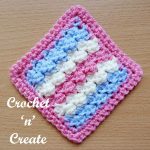 This entry was posted in crochet for the home, crochet for the kitchen, Table Mats and tagged crochet, crochet for home, crochet for Kitchen, crochet mat on 1st September 2018 by crochetncreate. 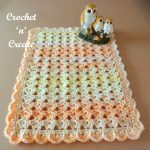 Free Crochet Pattern-Table Mat UK – Crochet this adorable table mat for your dining table, use colors to match your mood or for the seasons, it is made up of mostly treble crochet stitch with a double crochet edge, I am sure you will love the finished look. 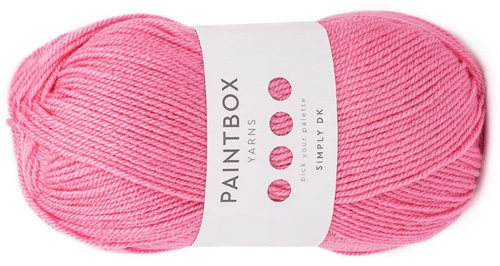 I used Paintbox Simply DK yarn for the sample in colours Lipstick Pink, Bright Peach and Champagne White. 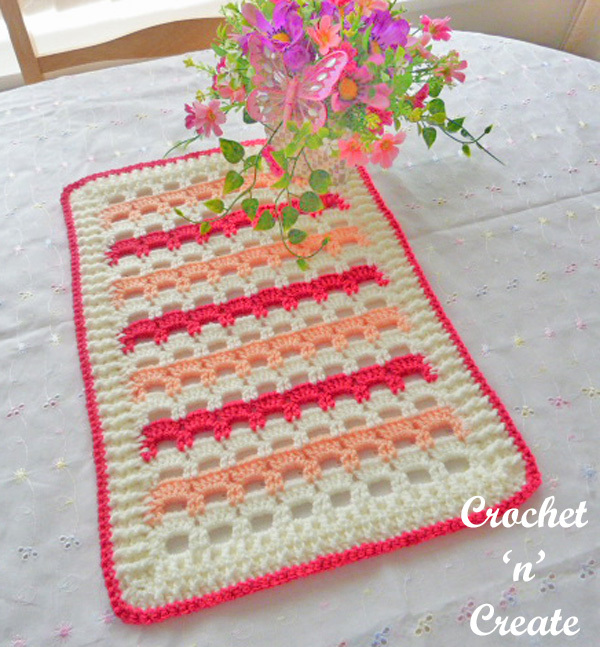 I have more free crochet patterns for table mats, click the links below to get them. 3rd Row – 3ch, 1tr into next tr, * 3ch, miss 3tr, 1tr into each of next 2tr, * rpt from * to * to end, work last tr into top of 3tch. Turn. 4th Row – Rpt 2nd Row. Fasten off. Turn. Rpt from # to # twice. Join in colour 1 and rpt 3rd Row. Turn. Border – (RS) 3ch, 1tr into next tr, * 3tr into next 3ch space, 1tr into each of next 2tr, * rpt from * to * to last tr and 3tch, 1tr into tr, 3tr into top of 3ch, work 2tr into each row end down first side of mat, 3tr into corner, 1tr into next tr, rpt from * to * along starting chain edge to last 2tr, 1tr into next tr, 3tr into next tr, work 2tr into each row end up second side of mat, 1tr into corner, ss to top of 3ch on beginning of row. Turn. Second Row – 3ch, 1tr into base of 3ch, * fptr around next tr, bptr around next tr, * rpt from * to * down first side of mat, 3tr into the corner, rpt from * to * along starting chain edge, 3tr into corner, rpt from * to * up second side of mat, 3tr into corner, rpt from * to * along top of mat, 1tr into corner, ss to top of 3ch on beginning of row. Turn. Make 3ch, 1tr into base of 3ch, work 1fptr around fptr, 1bptr around bptr to end, working 3tr into each corner. Fasten off. Turn. Using colour 3, starting with 1ch, 1dc into base of 1ch, work 1dc into each tr to end, working 3dc into each corner. Fasten off. 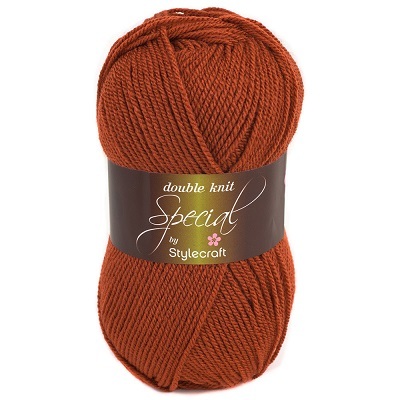 Finishing – Weave in and trim off all loose ends of yarn. 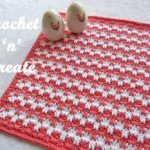 The written instructions and pictures for this free crochet pattern-table mat uk pattern are copyrighted to crochet ‘n’ create © 2018. 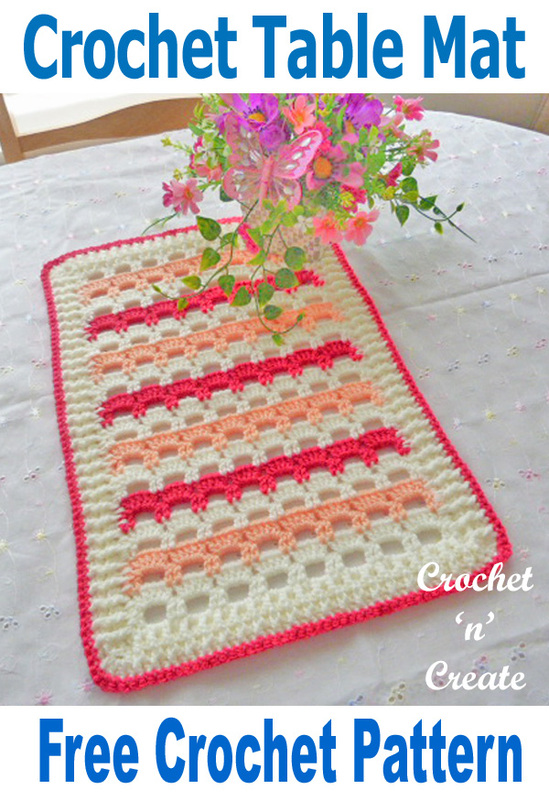 You are welcome to sell the finished products made from the free crochet pattern-table mat uk pattern, I just ask that you use your own pictures and put a link back to crochet ‘n’ create. 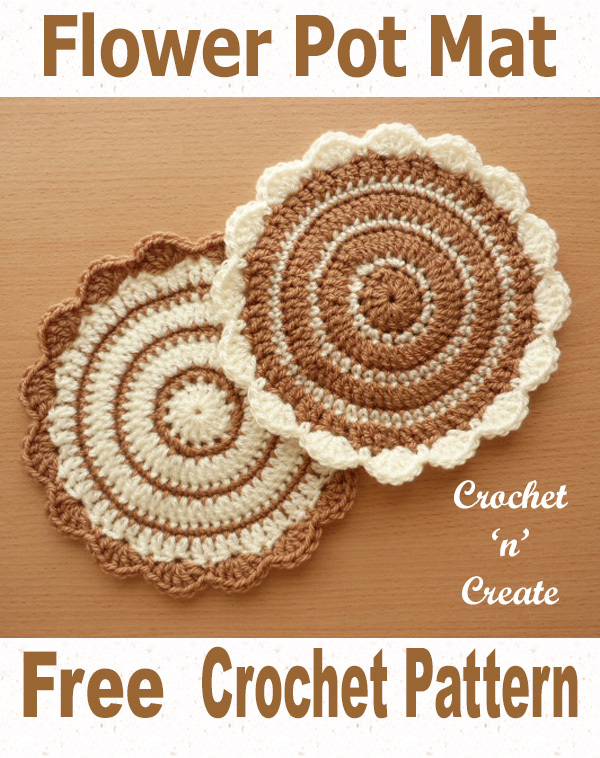 DO NOT share the written instructions for this free crochet pattern-table mat uk pattern.